Charming 2 BR 2 bath condo in desirable Riviera! This home features a large family Rm with gas F/P, tray ceiling in master, huge mst closet, vaulted ceiling in 2nd BR & breakfast area, tons of natural light, large kitchen w/ upgrades & huge island, view of the community pool from 2nd Bedroom, large covered patio (accessible from the breakfast area or secondary BR), spacious 2 car garage w/ workbench & cabinetry. Plus this quaint corner condo is the best location within Riviera! The pool is just around the corner & this condo is tucked in the back of the community w/ more privacy. This condo not only has a large 2 car garage but also extra parking at end of street for visitors. 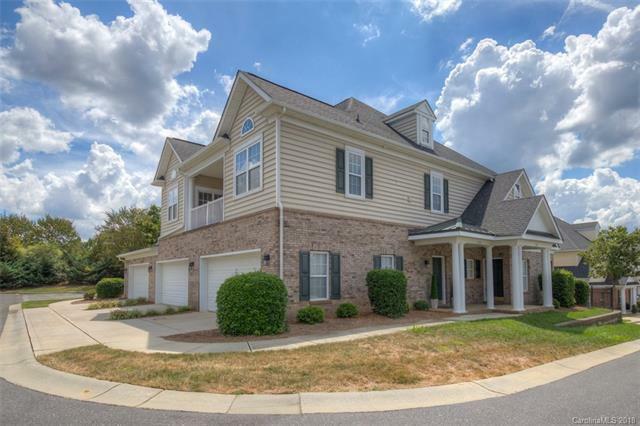 Very close to Ballantyne & retail/shopping. Don't miss your chance to own such a beautiful condo! Seller willing to convey fridge w/ right offer. TV niche exists above Fireplace. Curtains, rods & brackets owned by staging company & do not convey. Buyer/Buyer agent to confirm any schools & info deemed important.